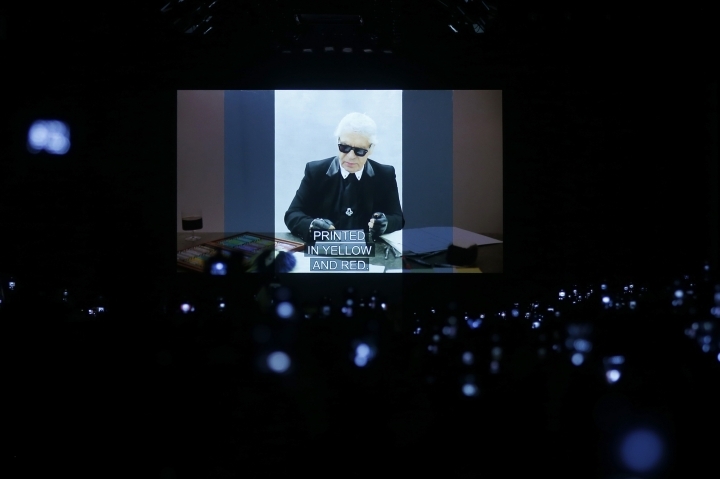 MILAN — Fendi paid understated tribute Thursday to Karl Lagerfeld, who died this week and was the Rome-based fashion house's creative director for 54 years. 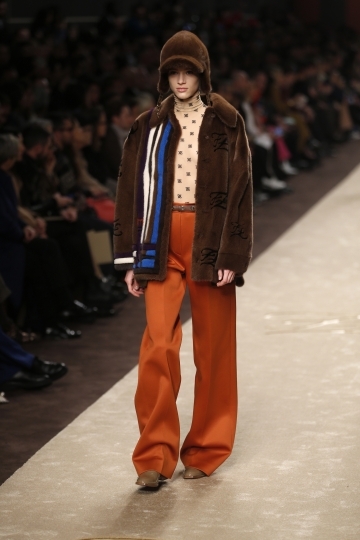 The fashion house said in notes for its Milan Fashion Week show that the Fall/Winter 2019-2020 collection "is the final collection designed by Karl Lagerfeld, representing a lifetime of dedication and creation from 1965 until today." 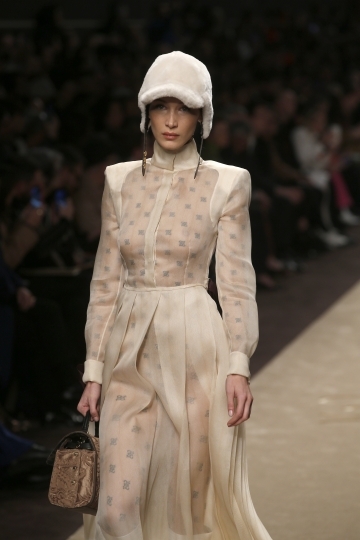 Reproductions of five of Lagerfeld's sketches accompanied the notes, summing up the looks. A small card came printed with his signature and the Fendi "F'' that had a heart forming the cross-stroke. The date of the designer's death was on the back: 19-02-2019. 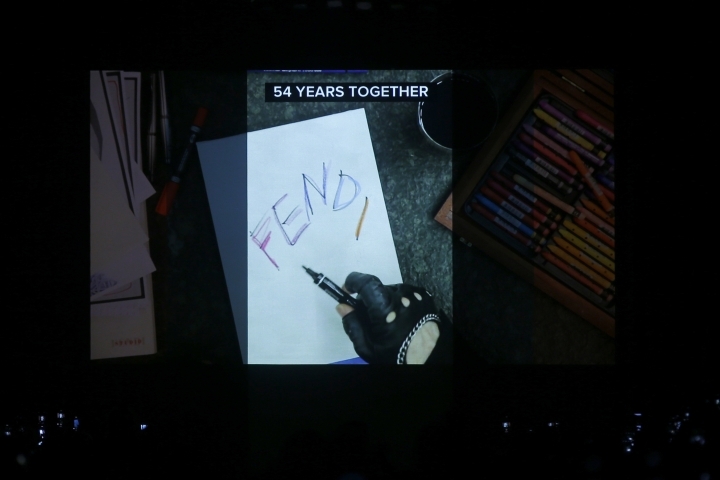 A video recorded before his death showed Lagerfeld being asked to draw himself as he appeared on his first day at Fendi. "Well, that's prehistoric," the designer said. "In the 1960s, we didn't hold back." His personal Fendi preview look: a Cerruti hat over his long hair, dark sunglasses, a printed Lavalliere tie, a yellow-and-red English hunting jacket in Scottish tweed, French-style culottes and a bag that he had found in Milan. "That was my style. Disreputable," the late designer told the camera in French. 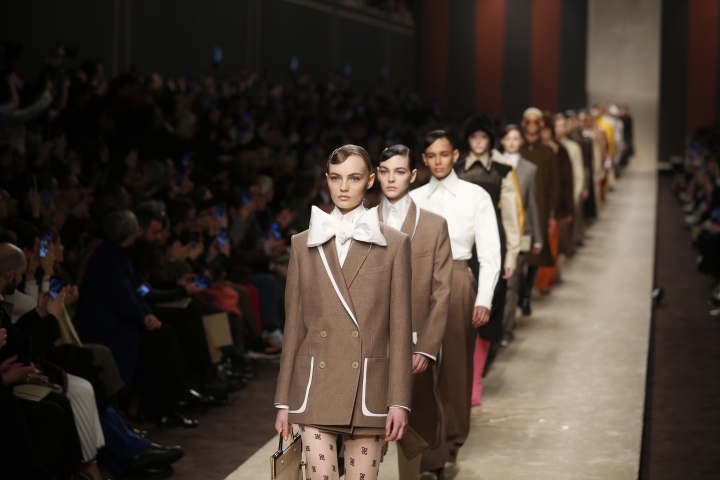 Karl Lagerfeld's grand finale at Fendi emulated the designer's signature style, with striking high collars and the models wearing ponytails at the nape. The opening look featured a huge bow tie and a double-breasted jacket with white accents, worn with a mini-skirt showing off Fendi tights. That look was elaborated on to show the same jacket as a long overcoat, then paired with wide-legged pleated trousers with white stripe accents. 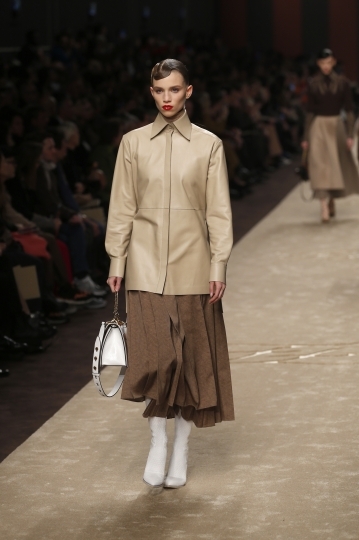 A neat, point-collared shirt buttoned to the top unified the outfits. .
A series of wide-pleated skirts in shiny finishes or sheers, as well as structured dresses with pagoda shoulders, pointy collars and cinched waists feminized the collection. Coats were luxurious furs with the elegant double-F logo in cursive - known as Lagerfeld's curling "Karligraphy" - and laser-cut leather with zippers that opened the sleeves and the back. 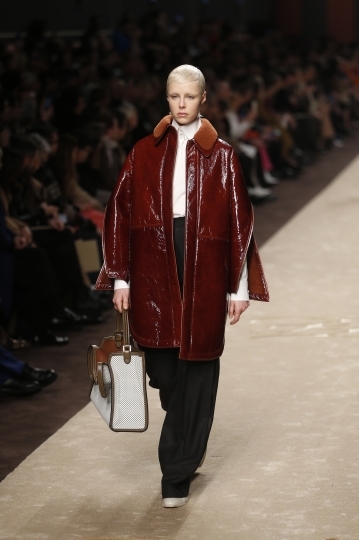 Shiny leather coats were shaped like capes and had open-zip arms and fur collars. 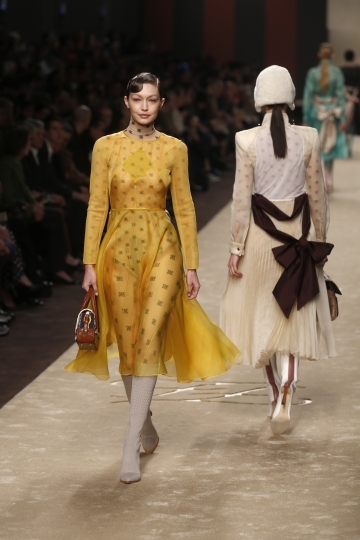 Beyond neutral tones, Lagerfeld included flashes of daffodil yellow, seafoam green and tangerine. 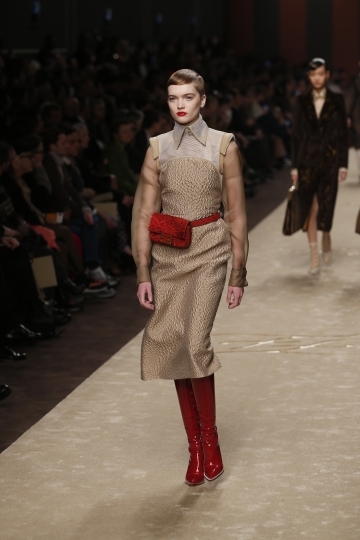 The looks were finished with fur riding caps, the Fendi Peekaboo bag with perforated detailing or the updated Baguette bag with a multi-strap harness. 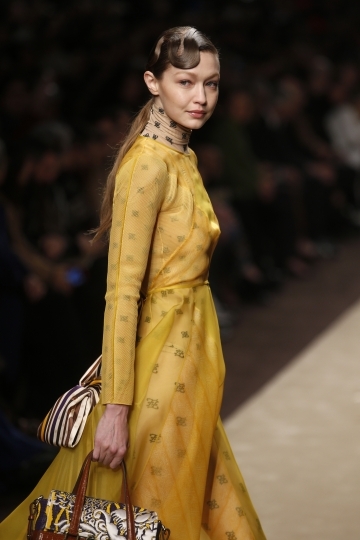 Gigi Hadid closed the show in a diaphanous mango dress with a snug Fendi-logoed bodysuit. A big bow floated on the back. 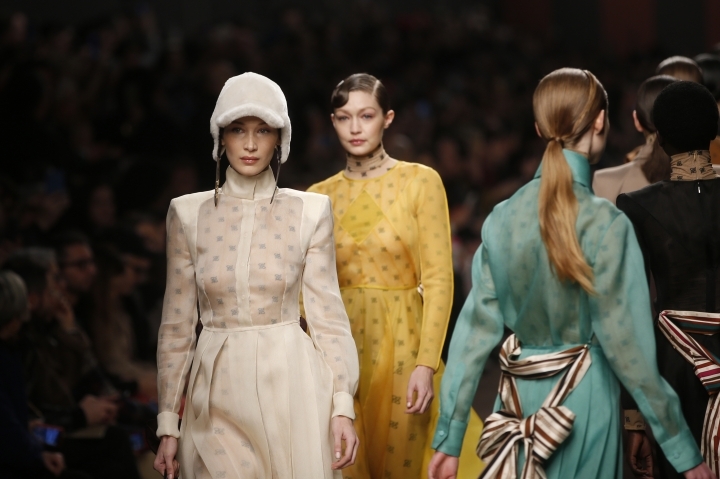 Silvia Venturini Fendi, who was a child when Lagerfeld joined Fendi and revolutionized fur at her family's fashion house, thanked the fashion crowd and took a bow, then clenched her fists and stepped backstage. A screen descended: Backstage was kept private. Venturini Fendi in a note said the bond between Lagerfeld and Fendi "is fashion's longest love story." "When we called just a few days before the show, his only thoughts were on the richness and the beauty of the collection," she wrote. "It's a true testament to his character. He shall be so missed."